We sat down with our founder, Coach Rippetoe, to talk about the connection between sleeping and swimming. Read on to see what our health, swimming, and fitness expert has to say. I sleep about 10 hours per day. Rest and recovery play a crucial part in both muscle regeneration and spiritual fitness! Part of those hours include at least one nap daily, and I start my day at 4:30 am meditating or reading. There are necessary physiological changes that occur during sleep. First, critical hormone processes are happening during the sleep cycle, including an increase in anabolic (muscle-building) hormones, and a simultaneous lowering of catabolic (muscle-wasting) hormones. Second, irregular and unpredictable sleep patterns limit the recovery power of testosterone in your body. Moreover, while we sleep, human growth hormones are being secreted in a pattern that lasts from 1.5-3.5 hours. When our sleep is disrupted, so are the benefits of this critical anabolic hormone. 2) As a swim coach, does swimming help other people sleep better? If so, why? The National Sleep Foundation conducted a poll and found a strong correlation between proper sleep and exercise, discovering that exercise does improve sleep, vital for health, productivity, and overall happier life. Additionally, according to the Anxiety and Depression Association of America, stress and anxiety may cause sleeping problems or make existing problems worse. Extended aerobic swimming workouts release the natural compound endorphins, the “feel-good” chemicals produced in your brain to combat those issues. Increased endorphin levels work to lower stress, increase pleasure, and reduce or manage pain. The release of endorphins do help to significantly lower anxiety and relieve depression. However, alongside the brain boost, swimming incorporates the same alternating stretches and regular breathing patterns of many yoga and other relaxation practices, creating a calming, meditative experience. 3) How would you describe the connection between sleeping, dreaming and water? According to Dr. Wallace J. Nichols, author of the national bestseller Blue Mind, good sleep is critical to good dreaming, and good dreaming is fundamental to creativity, learning, and memory. Studies continue to back this up, showing that REM sleep provides both the most vivid dreams and helps in the solving of complex mental and physical tasks. 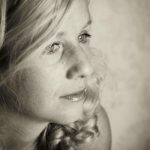 When looking at those three components from the metaphysical perspective, the connection remains, albeit in a less concrete fashion. 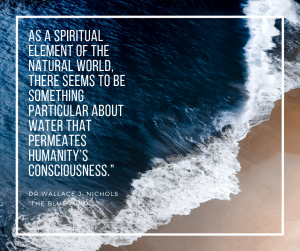 Still, as Dr. Nichols writes, “Indeed, as a spiritual element of the natural world, there seems to be something particular about water that permeates humanity’s consciousness.” (Blue Mind, pg. 235). Water continues to be one of the most common elements of the dream world with a deep connection to both emotion and the subconscious. While dream interpretation lies somewhat outside the scope of our expertise, our organization, One With The Water, knows that mastering the water creates a transformation in the mind of our students, a shift from a fixed mindset to a growth mindset.